The weather in Amsterdam is moderate, with warm, relatively dry summers and moderately cold and wet winters. 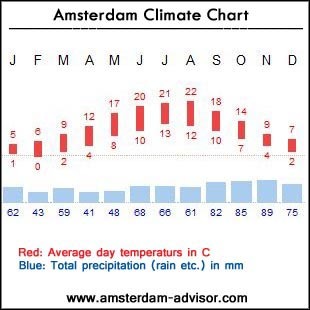 From June to August, day temperatures in Amsterdam's climate vary between about 20C and 25C (see chart below). During winter months, day temperatures are typically from 0C to 10C. At the same time, the Amsterdam weather is also unreliable. Sometimes it changes from sunny to cloudy/rainy and back to sunny again in a few hours. The Netherlands are often referred to as rainy, but it's actually not so bad. According to our national meteo, it only rains 4% of the time here! Strictly speaking, Amsterdam is an all-year-round destination. 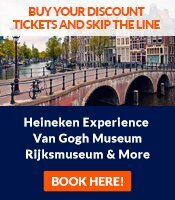 Most activities - canal boat tours, visiting museums, dining, going out - can be done during any season. During winters, especially when there's snow or ice, Amsterdam even has a special atmosphere. But to me, the city is at it's best during the spring and summer months - late April to September. During the spring, the city is fresh and lively and during the summer everybody is outside. Many events take place: Queens Day (April 30th), summer music festivals, etc. However, from mid June to mid August, the city is crammed with tourists. If you like the bustle, this is the time to go. But if you'd like to take the advantages of the summer months while avoiding tourist crowds, then either during May and early June, or late August to mid September would be the ideal time to visit. In October, the weather changes fast. It's the wettest month of the year. This has a special feel for us, too. But we agree it has to be your cup of tea. October is the month to be delving into second hand book stores and reading newspapers in our favorite grand cafes.